This is the fifth in the series on the experiences of the Gurkhas at Gallipoli exactly 100 years ago in August 1915. The Gallipoli Campaign had started on two main fronts, Anzac and Helles, and for three months since the invasion of 25 April 1915, the Allies had attempted to carry the offensive on the Helles battlefield at enormous cost for little gain. In August 1915, the British command proposed a new operation to reinvigorate the campaign by capturing the Sari Bair ridge, the high ground that dominated the middle of the peninsula above the Anzac landing. New assaults on Ottoman positions on the peninsula were planned, with the offensive to start on 6 August. It was hoped that the arrival of fresh troops would give the commander of the Allied forces one more chance to advance, this time from Anzac Cove north of Helles. For this offensive the commander of the Mediterranean Expeditionary Force, General Sir Ian Hamilton, was provided by Kitchener with three British New Army divisions: the 10th (Irish) Division, the 11th (Northern) Division and the 13th (Western) Division — all previously untried in battle. He was later reinforced with two Territorial Army divisions; the 53rd (Welsh) Division and the 54th (East Anglian) Division and one division of dismounted yeomanry; as well as the 2nd Mounted Division. It was becoming a big war. The aged Sir Frederick Stopford was sent out as supreme commander of IX Corps at Gallipoli. He had actually retired in 1909 and had never commanded men in battle. His appointment was made based solely on seniority, but his hesitancy during the preparations for the landing should have warned Hamilton that he was not a fit choice for the command. There had been some doubt about whether the British would abandon the campaign but this was dispelled when Winston Churchill made a careless speech in Dundee, stating that the battle would continue whatever the sacrifices. The enemy was now well aware that a renewal of the offensive was imminent. Consequently the Ottoman Fifth Army underwent a re-organisation and an expansion to 16 divisions. Ten of these defended the existing battlefields (six at Helles, which had seen the bulk of the early fighting, and four at Anzac). Three divisions defended the Asian shore of the Dardanelles and three divisions of the Ottoman XVI Corps defended the Gulf of Saros north of Bulair at the neck of the peninsula. The German and Ottoman generals anticipated that the offensive would involve a ‘breakout’ from Anzac, but were unsure whether it would be north (towards Suvla) or south (towards Gaba Tepe). A new British landing was also considered likely, but Suvla was not rated highly as a candidate, consequently only a modest force of four battalions defended the area. The Ottoman commanders also dismissed the possibility of an assault against the Sari Bair range due to the rugged terrain. Only Mustafa Kemal, commander of the Ottoman 19th Division at Anzac, expected the attack against the heights but he was unable to convince his superiors to significantly strengthen the defences — only one regiment was moved to the sector north of Anzac. In fact, the Allies considered the main peaks of the Sari Bair Ridge to be the prime target, and a night attack launched from the Anzac Cove beach-head was intended to be the battle winning blow. 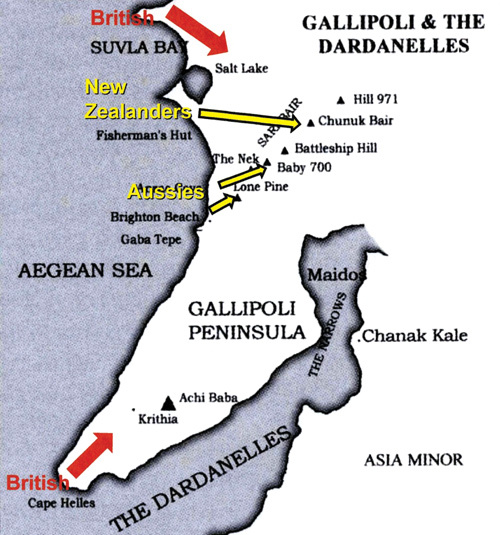 The bold (and in retrospect over-ambitious) plan to break the stalemate called for a vigorous offensive from ANZAC, the 13th Division and the 29th Indian Brigade combined with a surprise landing at Suvla Bay by IX Corps, under cover of a diversionary attack in the Helles area to pin down the Ottoman forces and prevent reinforcements being sent to the north. When the orders were issued for the offensive, some of the officers were deeply sceptical - particularly as to whether it was physically possible to carry out the planned flanking march at night in the dreadful country north of Anzac. “When the method of attack was disclosed to me confidentially that afternoon I gasped. It is to be remembered that Anzac is completely invested by the enemy; that no one has been able to reconnoitre the ground outside and that no one can absolutely guarantee the map. There are no villages and no inhabitants to help one, and the whole country seemed to be stiff, with very sharp rocky cliffs, covered with thick scrub. Zulu Day for the break-out from Anzac as well as the Suvla landings was fixed for the night of 6-7 August. Major General Alexander John Godley, who was in charge of the New Zealand and Australia Division and was ‘loathed by the rank and file’, would be the commander responsible and de facto corps commander. The approximately 4,800 strong ‘Indian’ force was to serve as the northern flank of ANZAC after the 29th Indian Brigade (including the three Gurkha battalions that had been involved previously) landed at Anzac cove on 5 and 6 August. It was decided that the new army divisions would actually land at Suvla after Godley’s troops had launched their attack in the hills above Anzac – via Lone Pine, Baby 700, Chunuk Bair, Hills Q, 971 and 60 – and all would combine to attack the Third Ridge. The 29th Indian Brigade, under Major General H Vaughan Cox was part of this plan, supposedly coming up to attack Hills Q and 971 located on Sari Bair. 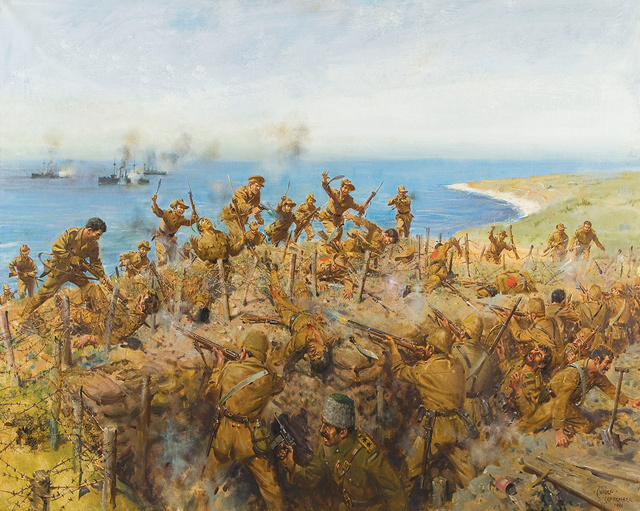 The main operation started on 6 August, with a fresh landing 8 km north of Anzac at Suvla Bay in conjunction with the Australian and New Zealand Army Corps mounting an attack north into the rugged country alongside the Sari Bair range with the aim of capturing the high ground and linking with the Suvla landing. The attack from the Anzac perimeter was to be directed against two peaks of the Sari Bair range: Chunuk Bair and Hill 971. To distract the enemy from the impending offensive, on 6 August, at 5.30 pm, an attack was made at Lone Pine by the infantry brigades of the Australian 1st Division. While the attack was ultimately successful in capturing the Ottoman trenches, it was counter-productive as a diversion as it attracted reinforcements to the north. Another costly diversion was carried out at Helles which resulted in a pointless struggle over a patch of ground known as Krithia Vineyard. As was the case at Lone Pine, the British action at Helles did not restrain the Ottoman defenders from sending reinforcements north to the Sari Bair range. Under the overall command of Major-General Alexander Godley, the attacking force included the New Zealand and Australian Division, the British 13th Division plus a couple of extra infantry brigades. The plan was for two assaulting columns to march out of Anzac on the night of 6 August. The right-hand column, comprising the New Zealand Infantry Brigade under Brigadier-General Francis Johnston, would head for Chunuk Bair. The left-hand column would head for Hill 971 and neighbouring Hill Q. Both objectives were expected to be captured by the early hours of 7 August – ideally by dawn. Smith also comments, presumably drawing on the same source as Farwell, that ‘the nature of the ground made it a forbidding task, with rugged steep spurs rising up from gullies which were covered with dense prickly clumps of scrub. 29 Indian Brigade set off in the dark, with inaccurate maps and without having had the chance to reconnoitre the ground beforehand; all told, it was a hazardous enterprise, the successful outcome of which depended on the Chunk Bair peak being captured before daylight on 7 August’. Starting out in the evening of 6 August, the advance began from the Anzac position and by the early hours of the morning the lower peaks had been reached and the way to the top appeared to be open. However, the advance seems to have been delayed. Smith refers to the ‘lack of any prior reconnaissance by junior leaders (which) began to play an important part as columns were delayed because guides lost direction’. Cox’s column, on the left, progressed slowly; tired, lost and scattered in the ravines, it never got close to the objective of Hill 971. The 2/10th and 1/5th Gurkhas, plus one company of the 2/5th newly arrived from France, set off to capture Hill Q. The 1/6th reinforced the Australians, who were attacking the adjacent peak (Hill 971). Two companies of Gurkhas lost contact with their column and instead offered to help the three companies of the Auckland battalion attack Chunuk Bair. The column on the left heading for Chunuk Bair, under the command of General A H Baldwin, had a simpler navigation task as their route was to some degree visible from the old Anzac perimeter. But the guides still lost their way – as Hamilton reported, ‘in plain English, Baldwin, owing to the darkness and the awful country, lost his way’. Any topic of interest to anyone can be freely discussed at Martin Chautari. It is the world of the word, but its members are also successful activists.